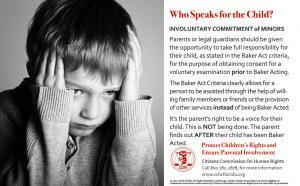 One in six Baker Acts were initiated on children during 2015/2016 prompting CCHR to launch a public information campaign to educate families on their rights. CLEARWATER, FLORIDA, UNITED STATES, June 28, 2018 /EINPresswire.com/ -- The Citizens Commission on Human Rights (CCHR), a non-profit mental health watchdog dedicated to the eradication of abuses committed under the guise of mental health, regularly hosts a seminar on the Florida mental health law, commonly referred to as the Baker Act, for the purpose of educating the public on their rights and how they can protect themselves and their loved ones from the abusive use of this law. 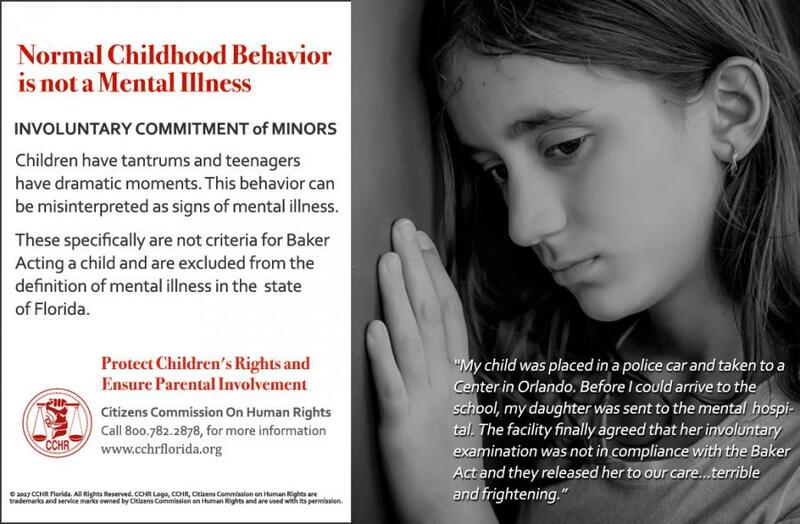 The alarming increase in the number of involuntary psychiatric examinations and the fact that one in six Baker Acts were initiated on children during FY 2015/2016 prompted CCHR to launch a public information campaign to educate Floridians on their rights under this law. As part of this campaign, CCHR hosts a seminar delivered by attorney Carmen Miller who, as a former Assistant Public Defender in the Thirteenth Circuit in Tampa, has a great deal of experience on the mental health law. Now in the private sector, Ms. Miller specializes in cases of those who have been Baker Acted. While the original stated intention of the Baker Act was to protect the rights of citizens sent for involuntary psychiatric examination, it has become a source of great abuse. To learn more about the Baker Act or to reserve a seat at the next seminar please call 727-442-8820. It is important for parents to know and understand the mental health law in Florida as this law allows a child to be removed from school and sent for involuntary psychiatric examination without parental knowledge. It's the parent's right to be a voice for their child.